Model FP140X hydraulic swaging machine is suitable for swaging up to 4 ft industrial/chemical hoses with cam and groove locking systems. VS control unit adjusts and swages to exact dimension in 0.01 mm increments. Control panel offers 200 memory settings for swaging diameters, die-sets, and offset. Model FP140X is suitable when variety of sizes and types of fittings, tube and pipe, wire and cable, and plastic and fiberglass need to be swaged. Schaumburg, IL. 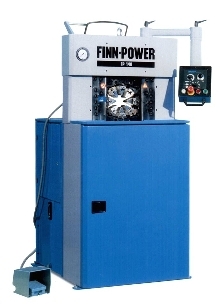 The FP140X hydraulic swaging machine is available from Finn-Power USA. The FP140X is a heavy-duty machine that is ideal when a variety of sizes and types of fittings, tube and pipe, wire and cable, and plastic and fiberglass need to be swaged. It is especially suitable for swaging up to 4' industrial/chemical hoses with cam and groove locking systems. The FP140X model is available with a swaging forces of 250 tons. The VS-control unit quickly adjust and swages to an exact dimension, and can adjust to 0.01mm increment. The operator-friendly, maintenance-free control panel offers 200 memory settings for swaging diameters, die-sets, and offset, and is simple to program. To ensure speed and accuracy on all jobs, the Finn-Power FP140X is designed with the following features: o soft and even die movements on all models o easy-to-use Quick Change Tool system feature allows quick and easy tooling changes More information on the FP140X swager can be obtained by contacting Finn-Power USA, 710 Remington Road, Schaumburg, IL 60173, (847) 885-3200. Finn-Power USA offers the industry's most complete line of hydraulic swaging/crimping machines, ranging from light-duty, hand-operated portable units to the larger production units.